Abstract: A Cooperative Multi-Vessel System (CMVS) is a system consisting of multiple coordinated vessels. Vessels utilize Vessel-2-Vessel and Vessel-2-Infrastructure communication to making decisions with negotiating and/or collaborating with each other for a common goal. Due to the geographic limitations of banks and navigation rules and regulations, in straight waterways, the cooperation of vessels usually results in train-like formations. This behavior is similar to the highway platooning of vehicles. A particular challenge arises when such platoons have to cross waterway intersections. At the intersections, the vessel trains need to interact with others. However, the research on interaction between vehicle platoons is still lacking. This paper focuses on the cooperation of vessels at waterway intersections. 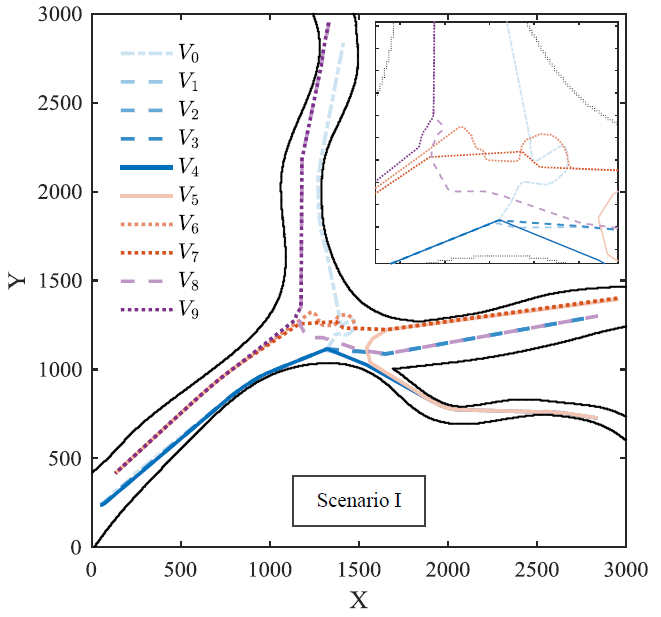 We propose a framework for cooperative scheduling and control of CMVSs at intersections. The actions of the vessels are determined by solving two problems: Waterway Intersection Scheduling (WIS) and Vessel Train Formation (VTF). Firstly, the process of the vessels passing through an intersection is regarded as consumption of space and time. The WIS helps to find a con ict-free schedule for the vessels from different directions. By solving the WIS problem, each vessel's desired time of arrival can be determined. Then, the actions of vessels are determined using a distributed Model Predictive Control algorithm in the VTF problem. Agreement among the vessels is achieved via serial iterative negotiations. Simulation experiments are carried out to illustrate the effectiveness of the proposed framework. We compare the passing time of each vessel, and the total passing time in three scenarios: non-cooperative case, partially-cooperative case, and fully-cooperative case. With the proposed cooperative framework, vessels can have smoother trajectories. The total passing time and the passing time for each vessel also benefit from the cooperation. Besides, the proposed framework can be extented to the whole waterway network where other infrastructure (bridges and locks) exists. Reference: L. Chen, R.R. Negenborn, J.J. Hopman. Intersection crossing of cooperative multi-vessel systems. In Proceedings of the 15th IFAC Symposium on Control in Transportation Systems (IFAC CTS 2018), Savona, Italy, pp. 379-385, June 2018. Open Access.